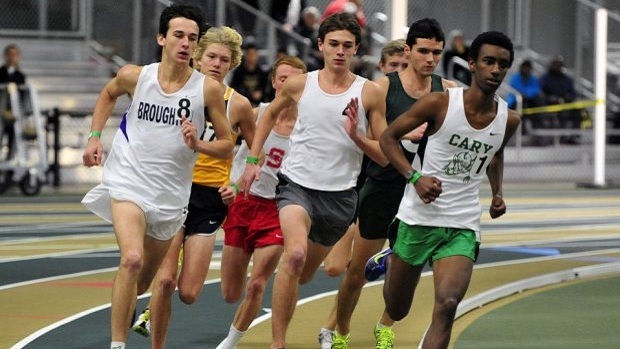 First, the were elite high school mile races at the NCRunners Elite Holiday Invitational. Next comes the Camel City Indoor Mile, scheduled for February 2nd as part of the Hilton Garden Invitational. Is this an intentional pattern of running the mile instead of the 1600 meters at the JDL Fast Track, or is it just a novelty? According to Craig Lonhurst, the director of the facility, the use of the classic English and American race distance is no accident. In addition to bringing top-notch talent to the JDL, Longhurst feels some affinity for the "Bring Back the Mile" movement, which is growing in strength across the country. The iconic distance has fallen largely by the wayside over the last 20 years, replaced internationally by the 1500 meter run and in American high school competition with the 1600, but neither of those races has the history of the mile. The 1500 only came on the scene when the modern Olympics were reborn in 1896, and may have had something to do with some tracks being 500 meters at the time (more likely, it is just a result of Europe's use of the metric system, in which 1500 is simply half of the 3000-meter race). The 1500, obviously, does not fit the pattern of the shorter races (100, 200, 400, 800), and that is why American schools compete in the 1600. Although commonly referred to as a mile, the 1600 is actually 9 meters short of an actual mile, which is why we have to make time conversions between the two distances. Of course, the 800 used to be the half-mile, and the 400 used to be the quarter-mile, but when American tracks were converted from 440 yards to 400 meters the 1600 became the standard. A growing number of people in the distance-running community think that we should return to the full mile distance, not just for American high school competition (which would be a fairly easy change) but also for international meets (a much bigger hurdle to overcome). And so, when Wesley Frazier and Bakri Abushouk ran nation-leading times on December 29th, it's possible that they were a part of something bigger, something that will continue through several sub-4-minute miles on February 2nd and into the future. Maybe, just maybe, they played a small role in changing the course of international distance racing. What do you think? Check out the poll in the forum, and add you voice if you have an opinion on the subject!